It may not come as a surprise, but the weekend sweep of Michigan Tech by UMD is a sizable achievement. Tech is a team like Bemidji that traditionally gives UMD fits with their slow down, muck-it-up style. UMD overcame slow starts both nights to pull out the wins. Friday night looked like a typical MTU/UMD grind it out game until the last minute of the second period through the third when UMD tallied five straight goals. Once the scoring started, it came from everywhere. Three goals from the FCC line included one even strength, one power play, and one shorthanded. Add in a goal from the third line (DeLisle) and the fourth line (Basaraba) and you get the outpouring of offense that was bottled up. The topper of Friday night was the shortie from the stick of Justin Fontaine. Note I did not say shot from Fontaine. 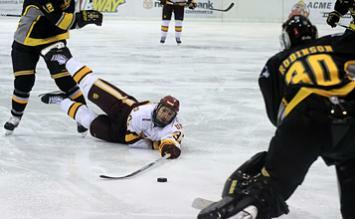 That is because it was a diving poke with his stick that found its way past the previously unbeaten Josh Robinson. See the photo below shoeing the effort nicely. Saturday’s win was again close until UMD exerted its offensive power midway in the second while at the same time clamping down defensively to make the 4-2 lead stick. Goaltending Save Escapades? UMD did have a good weekend in the split. The goalies get the nod, but the saves percentages from the Friday game is interesting on the low side. Crandall got the win Friday letting in 3 goals on 17 shots, 0.824 save percentage. It could be only quality shots from the Huskies or Crandall being lulled into oblivion. Either way, Crandall is off to a hot start and hopefully this was just a blip on the screen. Outcome. The sweep keeps UMD alone in first place in the WCHA. It has also fueled talk of the Bulldogs moving up to #1 in the national polls. Inside College Hockey has their Power Rankings out and has moved UMD to #1 from #2 last week. That is in part to BU tying both games this past weekend. The possibility (specter?) of being number one has not suited UMD squads well in the past. For whatever reason, #1 brings on too much pressure and has been the climax to a disastrous season in the not so distant past. In the 2004-05 campaign, the Bulldogs were ranked #1 after the first six games going 5-0-1. After that it was all downhill completing the season at 15-17-6. But this is a different team…right? Badgers Swept. Wisconsin, UMD’s next opponent, was swept at home by the Fighting Sioux of North Dakota. UND scored the only goal of the Friday game which rolled into Saturday’s 4-2 Sioux win. UNO Rolls On. The Mavericks of Omaha keep their WCHA unbeaten steak alive with a win and tie at Saint Cloud. On the flip side, the Huskies of SCSU are still in their tailspin now 4-6-2. It is strange, but the Huskies score when they let open the flood gates into their net, and they can’t score when they clamp down on the defense. Bemidji Wins First. The Beavers overcame themselves to win their first home game in the new Sanford Center. And they did it in fashion with a 4-0 shutout over Alaska-Anchorage.